Jeff Weinberg presented the bids for 170 new Samsung Galaxy Tab Education units, which will be used in kindergarten through third grade in the district and will be paid for by Microsoft settlement funds. He said the pricing was favorable. The board approved the bid of $42,857 from Global Gov/Education Solutions of Fletcher, OH. Weinberg said the district also received favorable bids on the 1,190 Dell Chromebook units heading to the high school as part of the 1:1 next year, where all students will have access to their own Chromebook. The board approved the bid of $292,740 from Tierney Brothers, Inc. of Minneapolis, Minn. The units will be paid for through technology funds and curriculum funds. The board approved renewal for MCSD to be part of the Urban Education Network, which is made up of the largest school districts in the state. The membership fee is $5,000 a year in the UEN and it provides lobbying, networking and other learning opportunities for MCSD staff. Lisa Koester presented the discipline data, which was mostly positive. She said the district continues to make good progress in decreasing in-school and out-of-school suspensions. Out-of-school suspensions dropped from 243 last year to 153 this past school year. Expulsions also remain lower than they were a few years ago. Koester said the district continues to look at ways to make students accountable for their actions, but still allow them time in school. Dr. Marvin Wade led this discussion and matched Iowa Assessment scores on how they fall on 10 different indicators in the Strategic Action Plan. The numbers talked about included fourth, eighth and 11th grade proficiency, growth and accelerated levels in reading and math, attendance rates, students taking college level coursework, classroom engagement and more. To view the numbers, click here. Board President Kay Beach will work on getting the eight pared down to 5 for the next meeting, possibly combining some of them as well. Click here for the full IASB priorities options available to the board. Matt Tullis gave an annual presentation as part of the Commitment to Equity. He said the Equity Advisory Committee met three times this school year. The committee wants to make sure the policies are made clear to the public. Tullis will work with the communications manager Andrew Potter on a clear link on the district website to access equity information. Tullis went through data and also presented the Affirmative Action Plan, which can be viewed by clicking here. He said one thing concerning in the data is there are 60 percent minority students in the district though only 6 percent of minority teachers. Tullis said the district continues to look at ways to recruit more minorities to MCSD. The board approved the plan. Rick Simpson and other project personnel gave an update on this project. Susan Jones of CPMI said the majority of the Roundhouse work is completed. One hold up on the project is tile remediation, with new tile to take three months to install. Jones said the some of the seams on the roof were not installed as expected. It is the goal of all involved that the gym will be ready for volleyball season this fall. Rick Simpson and Dave Schulze presented bids received on the water and storm drainage control project at Hoglan Elementary School, which also will work to add cooling inside the school. The board approved the bid to Hay Construction of Marshalltown of $488,250. The board also approved an increase in the construction contingency from $24,415 to $85,000 on the project to replace aging furnaces if they are deemed in need of replacement, after a request to do so was made by board member Sherm Welker. Schulze said he will ask the HVAC subcontractor to assess the status of the furnaces and their condition, as originally the project called just to add cooling capability to them. Superintendent administrative assistant Marilyn Rhodes put together a listing of policies and the date in which they were last reviewed. It was recommended by Rhodes to delete policies no longer in the policy book such as: 205.2, 401.9, 403.2, 405.9, 406.2, 407, 903.6, 904.6 and 905.3. Board member Bea Niblock will work with Rhodes to make sure the policies online and in the book are updated and the right ones are deleted. They will also work to make sure the updated policies are kept in one main place. Andrew Potter talked about the parent rallies featuring Consuelo Castillo Kickbusch, which are June 23 and 24 at Marshalltown High School. They will be held from 5:30 to 8 p.m. in the media center and all are invited. A work session followed the regular meeting to discuss administrative salaries. No action was taken by the board on the salaries. 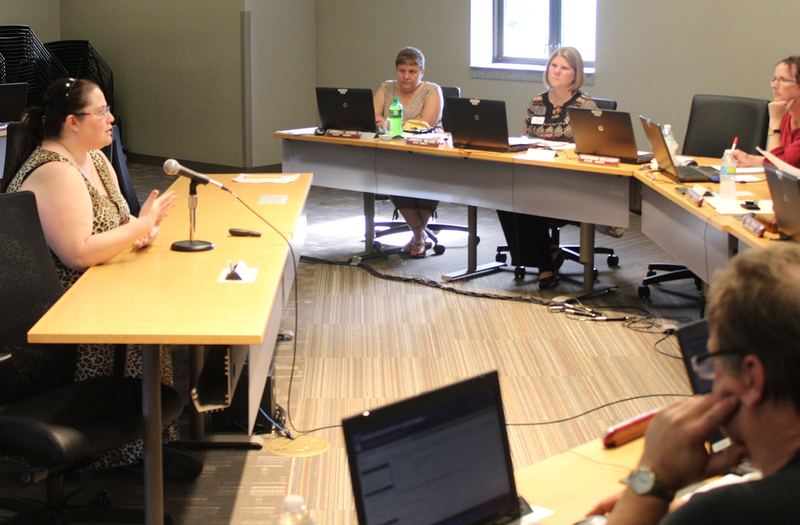 MHS teacher Jocelyn Frohwein, left, talks to the board about her selection into the Belin-Blank Fellowship Program at the University of Iowa during a meeting on June 1. MHS English teacher Jocelyn Frohwein talked about being selected for the Belin-Blank Fellowship Program, where she will study this summer for five days at the University of Iowa. There is also online work involved in the program. “I’m really excited about the opportunity,” she said. Frohwein said she is excited to learn about new ways to extend learning for her students beyond just what is being taught in class. Principal Anel Garza presented along with Woodbury staff members Sue Cahill, Tanda Stanton, Elizabeth Overstake, Mary Harris and Olivia Romero. The staff talked about several initiatives at the school including the dual language program, reader’s workshop, Spanish literacy standards, SIOP and parent involvement. At Woodbury, 295 of the 345 students are English Language Learners (86 percent). Also at the school 90 percent of students are on free and reduced meals. The staff was pleased to report that parent teacher conference attendance was 98 percent in both the fall and winter. 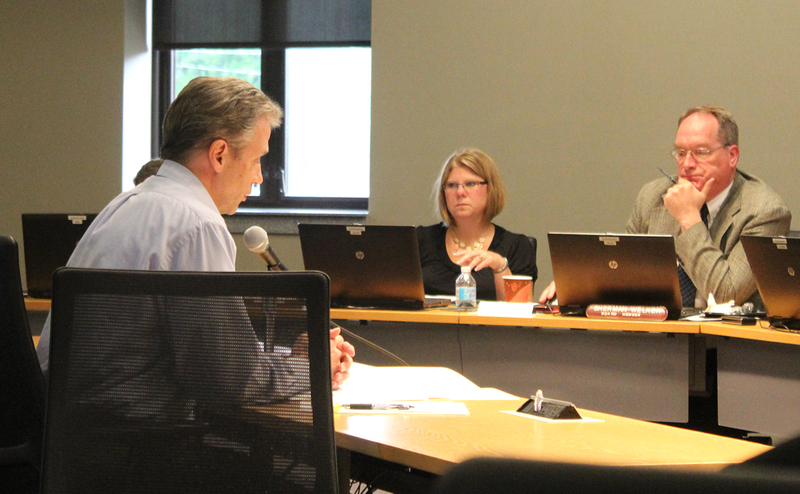 MLA Administrator Eric Goslinga updated the board on the school. MLA has reconfigured and reshuffled space to allow MLA and Four Oaks to have more separation in the facility. He said they are continuing work with personalized learning for students and “diving deeper into that.” There is also increased cooperation with Iowa Valley Continuing Education, he said. Goslinga also talked about a proposed dress code for MLA, which he said could be implemented for the 2016-17 school year. Parents of two MHS students wanted to open enroll out their students past the March 1 deadline for the 2015-16 school year. Dr. Marvin Wade said it’s a different standard for open enrollment after March 1. Parents proposed the pervasive harassment clause as a means to get their request approved, after incidents involving the students. Dr. Wade said he did not feel it met that pervasive harassment clause. The board did not approve the request from the parents by a vote of 4-3. Dr. Susan Pecinovsky presented to the board the Annual Progress Goals. All elementary breakfast and lunches will be for no charge based on the Community Eligibility Provision for next school year. There will be a 5-cent increase for breakfast and lunch for grades 5-12 for next school year. There will be a 15-cent increase for breakfast and 25-cent increase for lunch for adult meals. The board approved the new meal prices. The district is now receiving $ 2,300 per month from the cell tower lease, which is given to the schools on a per pupil basis. It has allowed funds for opportunities for students such as field trips. This was an information item and no action was taken. Lisa Koester presented the salary settlement between the district and the Marshalltown Education Association for teacher contracts for 2015-16. She said negotiations went well. The agreement calls for an increase to the bachelor’s base of $475 from $31,615 to $32,090 (teachers start at step 5 and not at the base). Three extracurricular positions were added and two were deleted. The increase in the base salary and teacher’s advancing on the salary schedule equates to a 2.95 percent increase over current year’s cost. The board approved the settlement 6-0, with one abstention. A public hearing for a budget amendment was held. Kevin Posekany presented the reasoning behind this budget amendment, which was approved by the board. The board went into closed session for the superintendent evaluation. The next regular board meeting will be at 5 p.m. on June 15.